The Daisy Do Vintage 1970's Style Owl Cookie Jar has a question that everybody likes to hear: Who wants a cookie? Don’t worry, this owl doesn’t only give out cookies from the 70s. 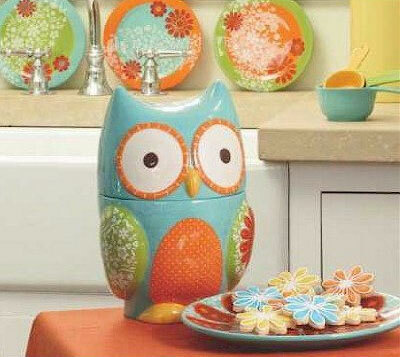 This Owl Cookie Jar is simply wonderful! The colors are so bright and so very 1970’s – in turquoise, orange, red, and green – a whimsical reminder of those days of mod colors and design! While you are at it, take a look at our matching salt & pepper set and soap dispenser in the same pattern… Ceramic. Size: 7″ x 6″ x 11 1/2″. I love this cookie jar, but the link to Amazon says it is unavailable! Anyone know where I can get it? I’m looking for this cookie jar and it’s out of stock on Amazon. Any ideas where I might try?